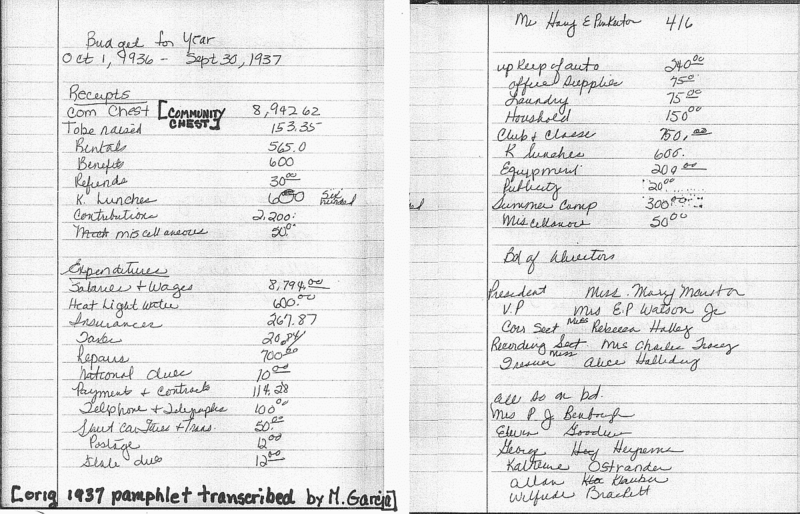 Funds were initially raised by the College Women’s Club. 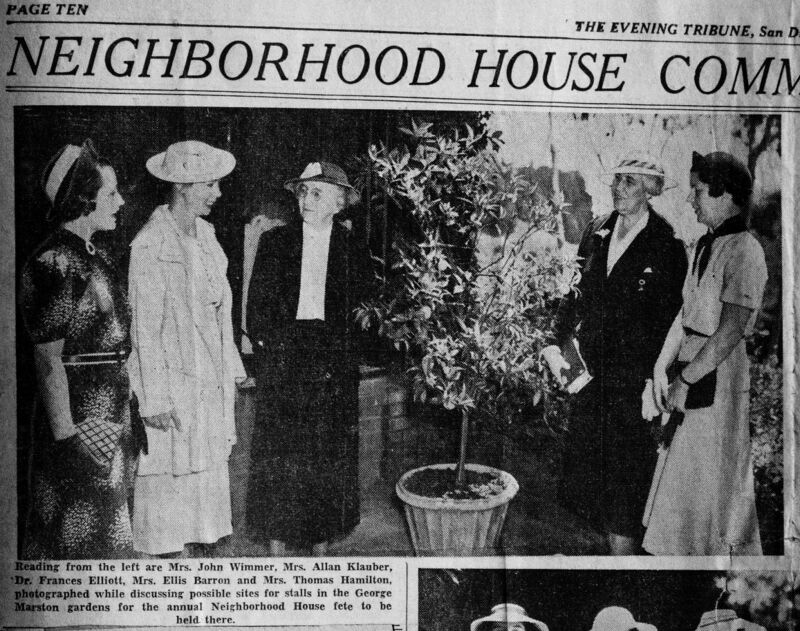 Neighborhood House, upon its incorporation as a private non-profit in 1914, became a charter member of the San Diego Community Chest, the precursor of today’s United Way of San Diego County. It would depend upon an extensive network of donors and philanthropic efforts to maintain its presence in Logan Heights. The local history of Neighborhood House is in many ways the history of prominent San Diegans. In the early years of the Neighborhood House the fundraisers held in the beautiful gardens of the Marston House were a main source of revenue. If you have not had the opportunity to visit the Marston House and walk around the beautiful garden, I recommend that you do. Many of these fundraising parties were held in the days before Freeway 163 was constructed. There were grass, trees and beautiful flowers as far as the eye could see. Even today, fountains and beautiful tile work is found throughout the gardens. To the right of one of the gardens, directly off the living room, is Balboa Park, serving as an extension to the beautiful gardens. Today, when sitting in the garden, the sound of traffic can be heard rather loudly, however the beauty of the garden remains almost 100 years later. There are very few pictures of men attending the garden parties. It is very possible that the parties were considered women and children events, or that the men were inside the house, away from the festivities. 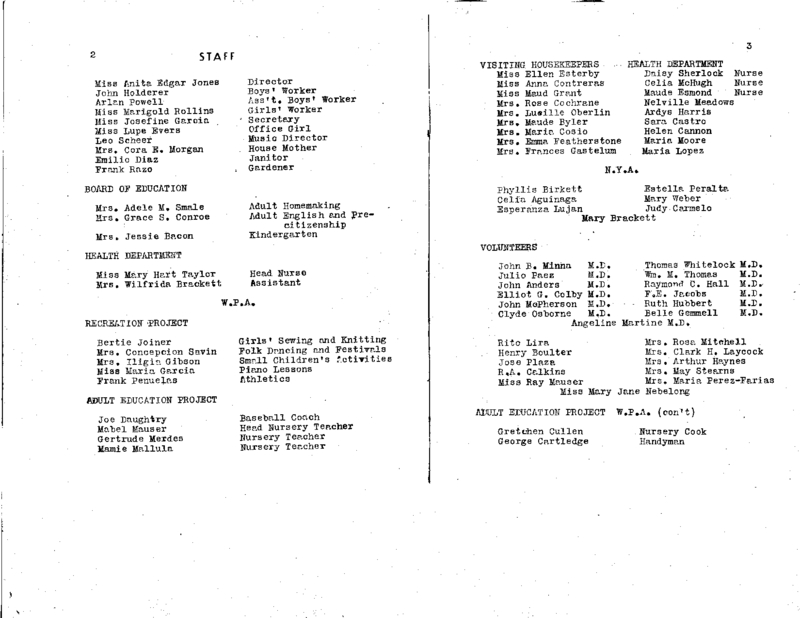 The women who attended were a Who’s Who in San Diego society. Pictures show women fashionably dressed with hats and high heels, which of course were the standard in those days. The society pages were full of pictures of the guests posing in the garden. As every school employee knows, if you want parents to attend a function, you have their children perform. The garden parties followed this theory, having the students from La Jolla Country Day School and Francis Parker School perform. 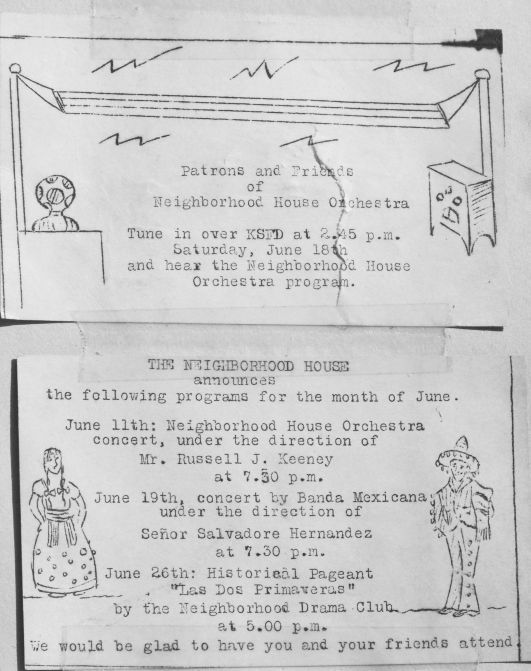 This was a not so subtle way of assuring that parents of the performers would attend the garden party and contribute financially to Neighborhood House. 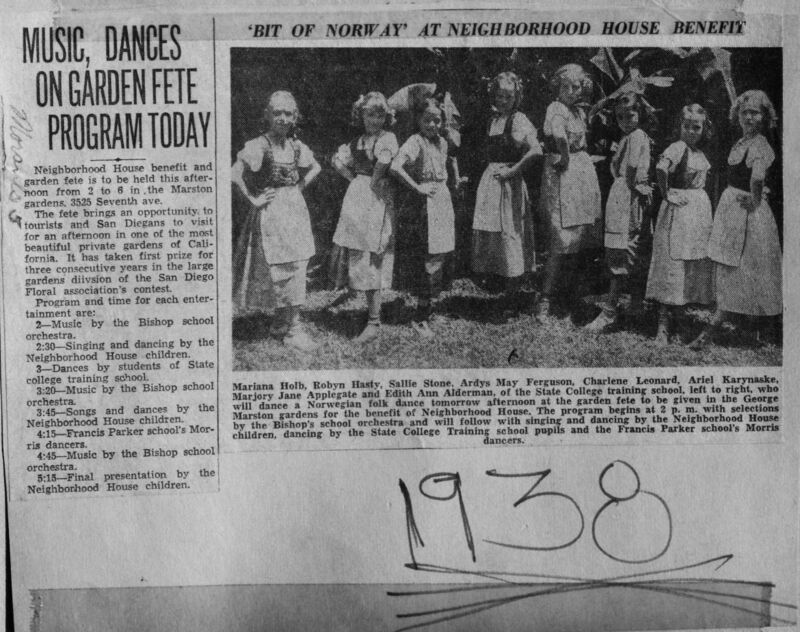 Every garden party – or fete, as referred to in some of the articles – included performers from Neighborhood House. The singing mothers, the dancers, the orchestra and many of the performers learned their particular talent at Neighborhood House. Little Mexican children dancing their heart out not only brought a certain pride on behalf of the kids, but allowed the supporters to see firsthand who their donations had benefited. I am sure the performances were designed to tug at the hearts of those who were donating to Neighborhood House. The “Americanization” emphasis is stressed at most events and yet the songs and dances had their origin in Mexico. Mr. Joe LeGerrette (father of Carlos LeGerrette) was born in Los Angeles and came to San Diego at the age of nine. He performed at various garden parties of the 1930’s as well as the garden parties held as late as 1959. Joe LeGerrette became a well-known San Diego musician. He not only played at Neighborhood House events but also at the Bostonia Ballroom, Mission Beach Ballroom and the El Cortez. He was able to earn a living by playing at the various venues, including the Del Mar Fair. In speaking with Carlos, he remembered several musicians that came from Neighborhood House. Names such as José Mano, José Garcia, Ray Valdemar and José Mata were all amazing talents who started at Neighborhood House. It was not unusual for the talent from Neighborhood House to perform at other locations. In general, many of the performances would be at Neighborhood House, Our Lady of Guadalupe Church and the San Diego High School. Today we could refer to it as the Barrio Circuit. Donations were solicited in newspapers, at fund raisers and in any creative way possible. I am sure word-of-mouth was one of the most successful ways of soliciting support. George Marston played a foursome of golf on a weekly basis. It was referred to as the Millionaire Foursome. They played for cash stakes and at the end of the game the cash was given to George Marston to be given to his daughter Mary to be used for her charity. Another method of raising funds was a competition among the women to see who could get their name in the newspaper most often. The person whose name appeared in the paper the most for each particular week was given money by the rest of the group. The person who “won” this contest would then donate the money to the charity of their choice. Mary Marston seemed to have a special talent for having her name in the newspaper– there was constant mention of Mary’s various activities. As the years passed, support was also provided by the Altrusa Club, the Junior League and the San Diego Community Chest. The depression years brought additional funding from many government programs, including WPA and local health department support for staffing. Volunteers also provided extensive support. 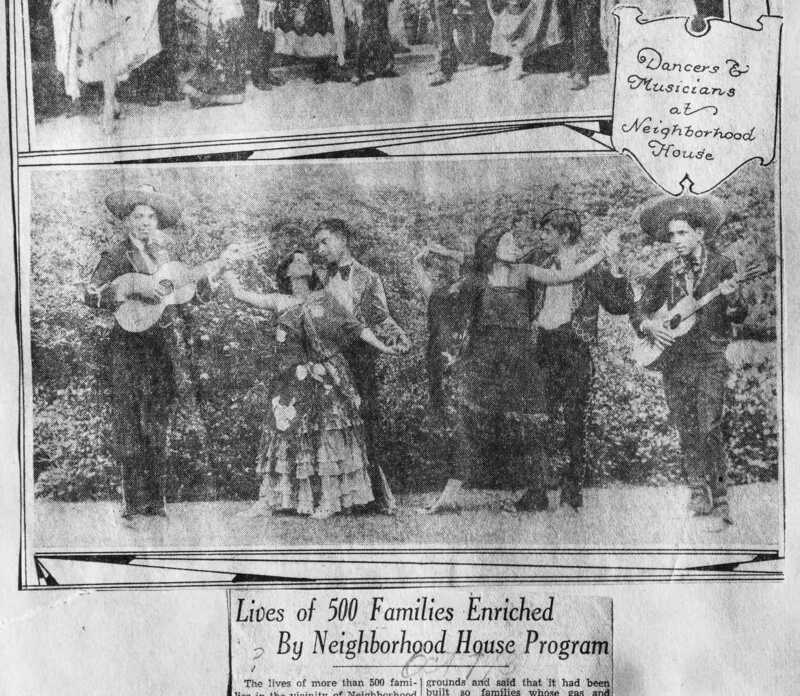 The newspaper was used to solicit donations and to inform the general public of what was being accomplished at Neighborhood House. News articles gave the organization the opportunity to showcase how their donations were being used. At times donations were articles of clothing or shoes. In many instances, donated clothes were taken apart and used to make new dresses, skirts or blouses. Very little went to waste if it could be reused in some way. Several of those people interviewed remember seeing trucks bringing donations of watermelons and other fruits that were then divided among the neighbors. The fruit truck would park by the fire station or in the alley behind Neighborhood House and pass out the fruit to the people in the community. The news media, which in those days was the newspaper, was a definite ally in soliciting support from the larger community. Today it may be seen as manipulating the media, but in total honesty I am in awe of how well the coverage of Neighborhood House was orchestrated. I recognize that the Marston name and sheer amount of advertising that George Marston underwrote for his department store must have had some influence on the media coverage. However it is also very obvious that the general public responded in a positive manner because of the news coverage. Christmas parties and Halloween parties held at Neighborhood House all became part of the news stories for hundreds of people to read which in turn contributed to not only the financial support but program efforts of Neighborhood House. In the 1950’s and 60’s events which were known as ship parties were held. The Navy would send a bus to Neighborhood House and pick up a group of kids to attend a party on a ship. In 1952 I had the opportunity to attend a ship party. The young sailors and enlisted officers were all very friendly and kind to all the kids. A huge meal was served in the galley with the highlight being the arrival of Santa Claus. That year Santa brought me a baby doll. In addition to Santa and the doll, I can remember being terrified when climbing the ladders (steps) from one deck to the other. I was sure that I would slip and fall and end up in the ocean never to be seen again. The local Mexican community contributed through the work they did at Neighborhood House. They constructed a community oven. The playground remodel was accomplished by the work the local dads and kids did. Moms also played a role in donating their time to cook for various functions. They helped teach cooking, sewing or any other skill they could, to contribute and to support Neighborhood House. 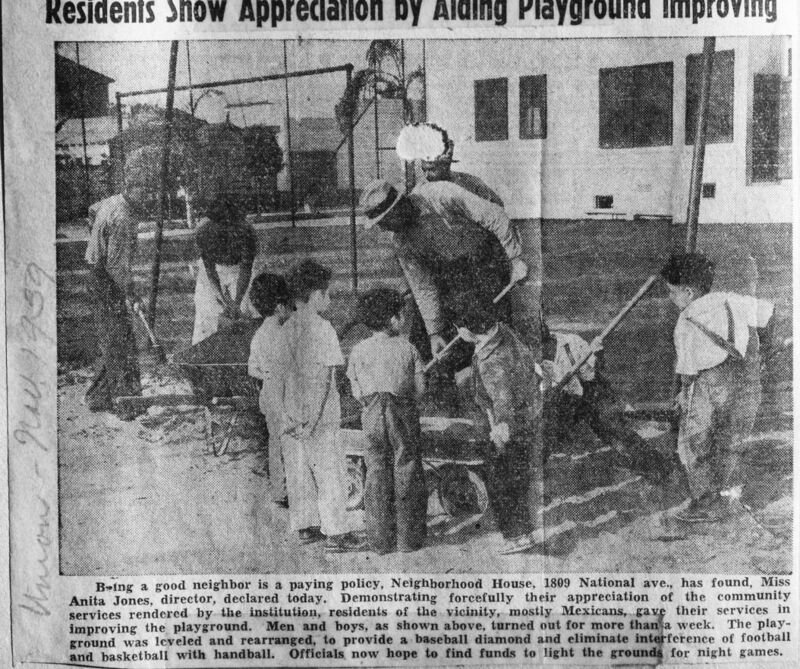 Even though they did not have the deep pockets that some of the Anglo community had, they were more than willing to work to make Neighborhood House a better place for the kids in the community. All of these resources contributed to the success of Neighborhood House. A special thank you to Sarai Johnson for sharing information about the Marston family. Editor Note: This article was updated to include a photograph with Joe LeGerrette playing the guitar.